(Nanowerk News) Babies learn about the world by exploring how their bodies move in space, grabbing toys, pushing things off tables and by watching and imitating what adults are doing. But when roboticists want to teach a robot how to do a task, they typically either write code or physically move a robot's arm or body to show it how to perform an action. Now a collaboration between University of Washington developmental psychologists and computer scientists has demonstrated that robots can "learn" much like kids — by amassing data through exploration, watching a human perform a task and determining how best to carry out that task on its own. "You can look at this as a first step in building robots that can learn from humans in the same way that infants learn from humans," said senior author Rajesh Rao, a UW professor of computer science and engineering. "If you want people who don't know anything about computer programming to be able to teach a robot, the way to do it is through demonstration — showing the robot how to clean your dishes, fold your clothes, or do household chores. But to achieve that goal, you need the robot to be able to understand those actions and perform them on their own." A collaboration between UW developmental psychologists and computer scientists aims to enable robots to learn in the same way that children naturally do. The team used research on how babies follow an adult’s gaze to “teach” a robot to perform the same task. The research, which combines child development research from the UW's Institute for Learning & Brain Sciences Lab (I-LABS) with machine learning approaches, was published in a paper in November in the journal PLOS ONE ("A Bayesian Developmental Approach to Robotic Goal-Based Imitation Learning"). In the paper, the UW team developed a new probabilistic model aimed at solving this fundamental challenge in robotics: building robots that can learn new skills by watching people and imitating them. The roboticists collaborated with UW psychology professor and I-LABS co-director Andrew Meltzoff, whose seminal research has shown that children as young as 18 months can infer the goal of an adult's actions and develop alternate ways of reaching that goal themselves. In one example, infants saw an adult try to pull apart a barbell-shaped toy, but the adult failed to achieve that goal because the toy was stuck together and his hands slipped off the ends. The infants watched carefully and then decided to use alternate methods — they wrapped their tiny fingers all the way around the ends and yanked especially hard — duplicating what the adult intended to do. Children acquire intention-reading skills, in part, through self-exploration that helps them learn the laws of physics and how their own actions influence objects, eventually allowing them to amass enough knowledge to learn from others and to interpret their intentions. Meltzoff thinks that one of the reasons babies learn so quickly is that they are so playful. "Babies engage in what looks like mindless play, but this enables future learning. It’s a baby’s secret sauce for innovation," Meltzoff said. "If they're trying to figure out how to work a new toy, they're actually using knowledge they gained by playing with other toys. During play they're learning a mental model of how their actions cause changes in the world. And once you have that model you can begin to solve novel problems and start to predict someone else's intentions." Rao's team used that research on babies to develop machine learning algorithms that allow a robot to explore how its own actions result in different outcomes. Then it uses that learned probabilistic model to infer what a human wants it to do and complete the task, and even to “ask” for help if it's not certain it can. 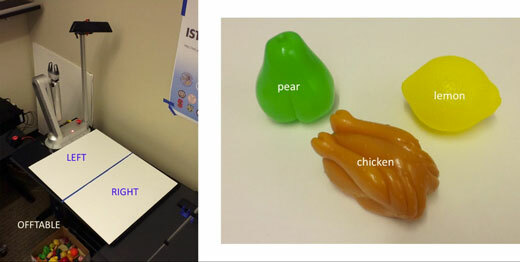 The team tested its robotic model in two different scenarios: a computer simulation experiment in which a robot learns to follow a human's gaze, and another experiment in which an actual robot learns to imitate human actions involving moving toy food objects to different areas on a tabletop. This robot used the new UW model to imitate a human moving toy food objects around a tabletop. By learning which actions worked best with its own geometry, the robot could use different means to achieve the same goal — a key to enabling robots to learn through imitation. In the gaze experiment, the robot learns a model of its own head movements and assumes that the human's head is governed by the same rules. The robot tracks the beginning and ending points of a human's head movements as the human looks across the room and uses that information to figure out where the person is looking. The robot then uses its learned model of head movements to fixate on the same location as the human. The team also recreated one of Meltzoff's tests that showed infants who had experience with visual barriers and blindfolds weren't interested in looking where a blindfolded adult was looking, because they understood the person couldn't actually see. Once the team enabled the robot to "learn" what the consequences of being blindfolded were, it no longer followed the human's head movement to look at the same spot. “Babies use their own self-experience to interpret the behavior of others — and so did our robot,” said Meltzoff. "If the human pushes an object to a new location, it may be easier and more reliable for a robot with a gripper to pick it up to move it there rather than push it," said lead author Michael Jae-Yoon Chung, a UW doctoral student in computer science and engineering. "But that requires knowing what the goal is, which is a hard problem in robotics and which our paper tries to address." "Babies learn through their own play and by watching others," says Meltzoff, "and they are the best learners on the planet — why not design robots that learn as effortlessly as a child?"